The above photo is of me teaching a workshop in Nairobi, Kenya a few years ago. I get overseas from time to time. But most of my ministry takes place at Wycliffe’s JAARS Center in North Carolina. Teaching, supervising, consulting and counseling covers the range of what I do with Wycliffe Bible Translators. I have been working in counseling ministries with Wycliffe since 1987. If you’re doing the math, that adds up to nearly 30 years of service in missions. When people find out that I counsel missionaries, I usually get one of two responses: They either give me a puzzled look as if to say, “What kinda problems do missionaries have anyway? Do they struggle with scheduling prayer times or something?” Or they nod knowingly and say, “Yeah. Missionaries are pretty messed up people. I bet you have more work than you can handle.” Not surprisingly, the truth is somewhere between those two polarities. I work with a wonderful clientele…who are real people with real struggles doing a really demanding job in really unusual locations. I have lived in those places and had those diseases and felt those stresses. So, I’m not totally awestruck by people who come to me for counseling. Because I’m also in Wycliffe Bible Translators, I share their vision and love for Bible-less people. I have a good bit of natural empathy for my colleagues but at the same time, I have a sense of the importance and magnitude of the task. The shared goal of seeing the Scripture translated into every language is powerful motivator for both client and counselor in this setting. Okay, having said that…here is my little corner of the kingdom. I am the Clinical Director of the Wycliffe USA Counseling Ministries. That means I oversee the clinical practice of all Wycliffe USA counselors serving at our centers in Orlando, Fl; Dallas, TX; and Waxhaw, NC. My job is to make sure our people are qualified, competent, and providing professional, ethical and legal treatment to the organization. I also consult with mission administrators about “problem” cases in the missions world. I work with International Personnal Administration and Wycliffe USA Human Resources when they have questions about the well being of our people. I also work for myself as the Assoicate Director of the Waxhaw Counseling Office. So, as Clinical Director, I oversee myself overseeing the counseling clinic at the JAARS Center. I supervise the counselors working out of this busy Bible translation hub. The JAARS counseling office provides services to missionaries working all over the Wycliffe world. I have an awesome staff here. I am honored to work with the best Christian counselors in the profession. Trust me. These people are good. And they show up everyday to offer their services for free. I also work for myself as a Counselor at the Waxhaw office. I carry a full counseling load in addition to my clinical and administrative responsibilities. I am definitely able to keep my head in the clinical game. Supervisors don’t want to lose perspective regarding the day to day realities of managing cases and treatment plans. So, I am blessed to have my perspective carefully honed every single day, all day long. I also supervise counselors going through the Counselor Orientation and Development Course (CDOC). CDOC is our orientation course for new missionary counselors. If you want to serve as a counselor overseas with Wycliffe, you have to successfully complete CDOC. The course doesn’t attempt to teach counselors how to counsel. We screen applicants for professional competency and credentials. CDOC is designed to introduce new missionary counselors to the peculiarities of working with diverse populations overseas. 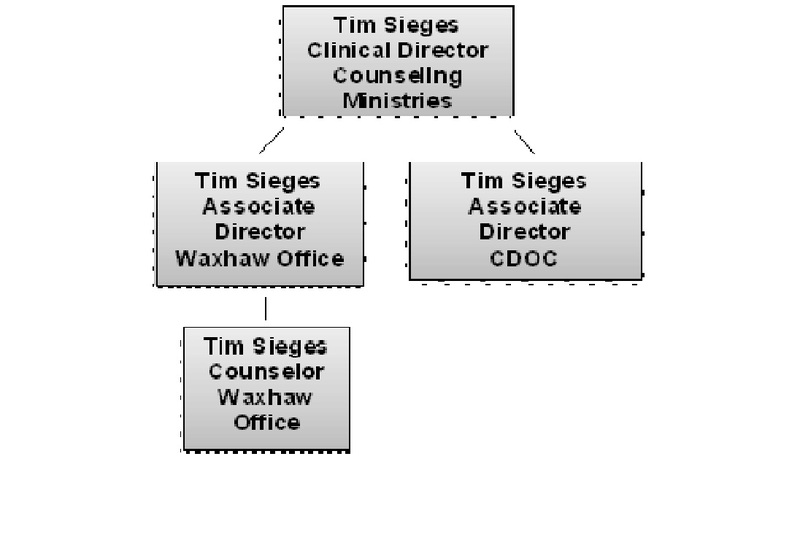 Okay…so follow me on this little organizational flow chart: My immediate supervisor as a counselor is me the associate director for Waxhaw. My boss as associate director and CDOC supervisor is me as the Clinical Director. But my boss’ boss’ boss’ is the Senior Director of Ministry and Care Resources (MACR) in Portland, Oregon named Vera Stair. Sure hope you followed all that. It gets kinda complicated in missions with too few people doing too many jobs. But that’s what we do. And we are EXTREMELY honored to do it in the Name of our great Lord and Savior. Bless you as you always bless us.